Today’s choice is two-parts Vivian, one-part Genevieve. 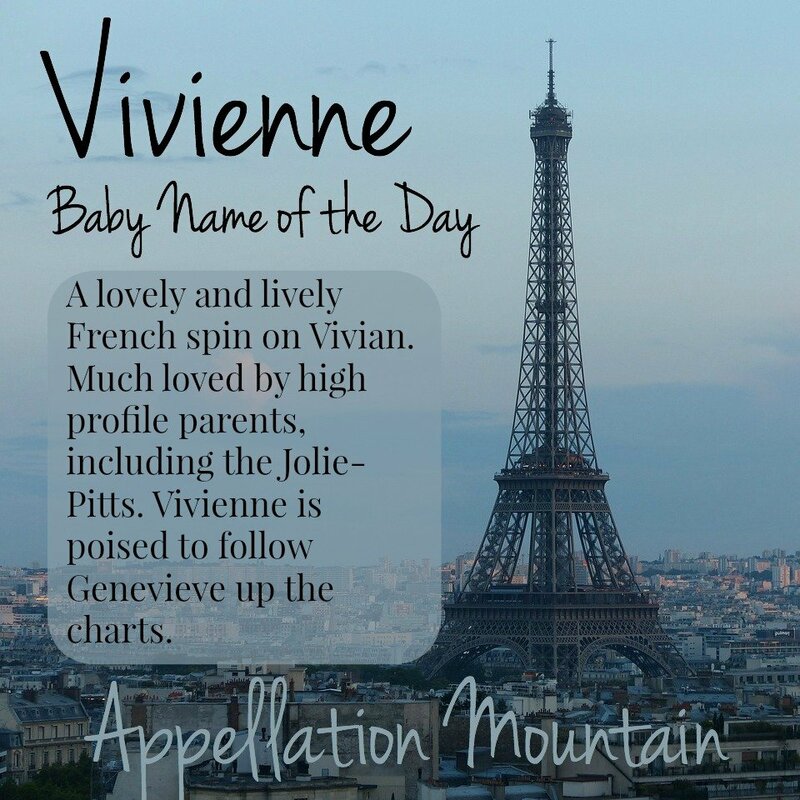 Inspired by Appellation Mountain’s most popular Pinterest pins, our Baby Name of the Day is Vivienne. Are Vivian and Vivienne the same name? Is Vivian just the spare, restrained form, and Vivienne the slightly more frou-frou, français version? Vivian is often cited as an early stolen-from-the-boys name, but that’s not quite right. All of the names in this family come from the Latin vivere – to live. Words like vivacious, vivid, and vital all have vivere on their family trees, too. There was a fifth century Saint Vivianus, and forms of the name have been in use for centuries, including the feminine Viviana. Tennyson gave the name Vivian or Viviane to a wily schemer in his re-telling of Arthurian legend, and there’s an Irish goddess whose name is often Anglicized as Vivian. So there’s a long history of Vivian as a unisex name. In French, the name became Vivienne, in contrast to the masculine Vivien. The emphasis is a little different when most people say it: viv ee EHN versus viv EE an. In the US, the -enne spelling was a sleeper. Vivian was a Top 100 staple for girls from 1911 through 1934. 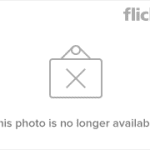 During that time, some parents opted for the -enne ending – but only a few. Today, the story is very different, and that’s all thanks to a 2008 birth announcement. In 2009, Vivienne re-entered the US Top 1000 for the first time in eight decades. Rosie Pope’s Vivienne Madison, born in 2012. Ali Larter’s Vivienne Margaret, born in early 2015. And, of course, Rosie O’Donnell was actually the mother of a Vivienne Rose all the way back in 2002. As of 2013, Vivienne ranked #280 in the US, behind Vivian at #119. But my guess is that the -enne spelling will eclipse the -ian version in 2015. 1124 girls in 2013 were given then -enne spelling. That’s a huge leap from 109 girls in 2003. Vivian feels like a practical name, while Vivienne shimmers with a certain style. Westwood is also a well-known activist and advocate of the arts. That’s not to say that Vivian can’t sparkle. Both names share the lively nicknames Viv and Vivi. But American parents do tend to fall for French names, and Vivienne seems poised to follow Genevieve up the charts. Meanwhile in France, Vivienne remains in style limbo – the name peaked back in the 1930s. While Vivian is consistently the more popular spelling, the -enne version is rising quickly. Even though the Jolie-Pitts were the ones to push Vivienne into broader use, this name doesn’t feel like a trendy choice. Instead, Vivienne feels elegant, restrained, and feminine – and not too widely used, at least for now. Just a note that Viviane is actually the much more common spelling in France and other French-speaking countries. If the stats on MeilleursPrenoms.com are accurate, there are over 48,000 Vivianes in France versus 943 Viviennes. Viviane was a popular mid-century name that is virtually unused today. I’ve never come across a French person named Vivienne. I like both, though; Viviane was very nearly my daughter’s name! I like Vivianus as the first name for a boy, since Vivian has been taken over by girls. Vivianus says all boy and matches with names like Aurelianus. I do like the the Vyvyan spelling, and I had my heart set on using it on a boy, Vyvyan Voltaire, for a while. Vivianna makes a perfect feminine choice without mucking up the already murky waters in this 20th century gender bender. The name is saintly, gorgeous, and a classic. I enjoyed reading this post. Ohh, do not forget the “devine secretes of ya-ya sisterhood” cults from the movie/book. The Vivian took on a bit of a souhtern charm for both boy and girls. 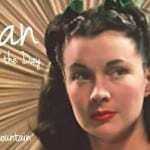 Not to mention the actress Viviene Leigh who helped bolster the name as a girls name here in the U.S. Such a pretty name but spunky too thanks to the Vivi nickname.